The Bernier Lab had an amazing presence at the 2017 International Meeting for Autism Research (IMFAR) in San Francisco, CA. Below are staff’s poster presentations, including jpeg and downloadable PDFs. Also, make sure you check out our photo gallery of 2017 IMFAR! 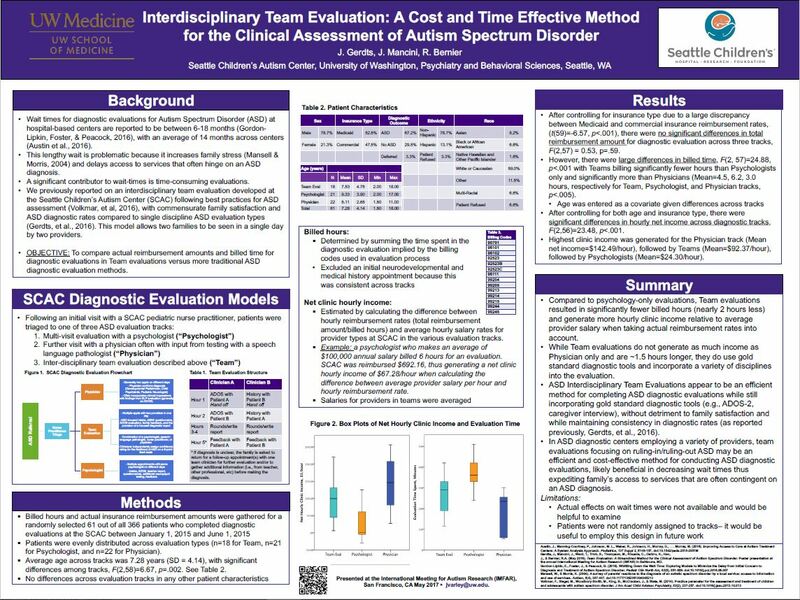 Gerdts, J., Mancini, J., Bernier, R. Interdisciplinary Team Evaluation: A Cost and Time Effective Method for the Clinical Assessment of Autism Spectrum Disorder. Poster presentation at the annual International Meeting for Autism Research (IMFAR) in San Francisco, CA. 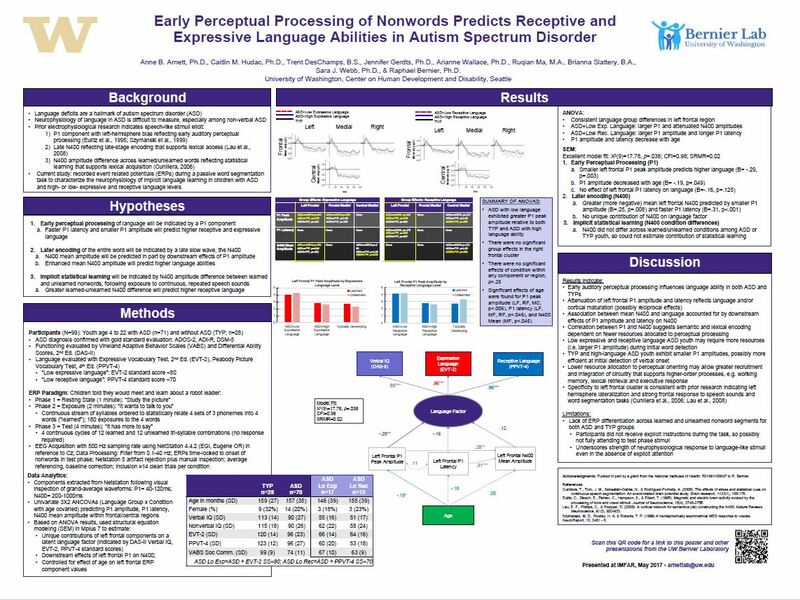 Arnett, AB, Hudac, CM, DesChamps, T, Gerdts, J, Wallace, A, Ma, R, Slattery, B, Webb, SJ, Bernier, R. Early Perceptual Processing of Nonwords Predicts Receptive and Expressive Language Abilities in Autism Spectrum Disorder. Poster presentation at the annual International Meeting for Autism Research (IMFAR) in San Francisco, CA. 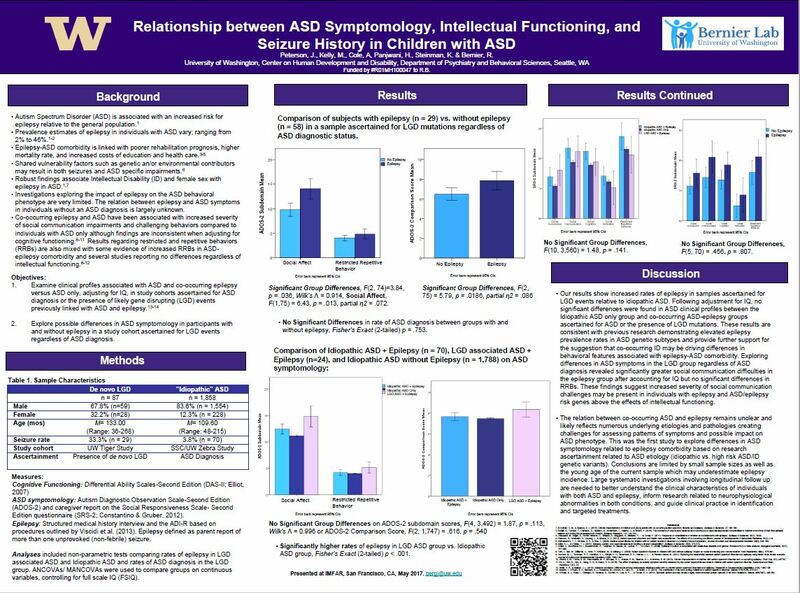 Peterson, J., Kelly, M., Cole, A., Panjwani, H., Steinman, K., Bernier, R. Relationship between ASD Symptomology, Intellectual Functioning, and Seizure History in Children with ASD. Poster presentation at the annual International Meeting for Autism Research (IMFAR) in San Francisco, CA. Trinh, S., Goin-Kochel, R.P., Bernier, R. Gene Expression correlates of Language Regression in Autism Spectrum Disorder. Poster presentation at the annual International Meeting for Autism Research (IMFAR) in San Francisco, CA. 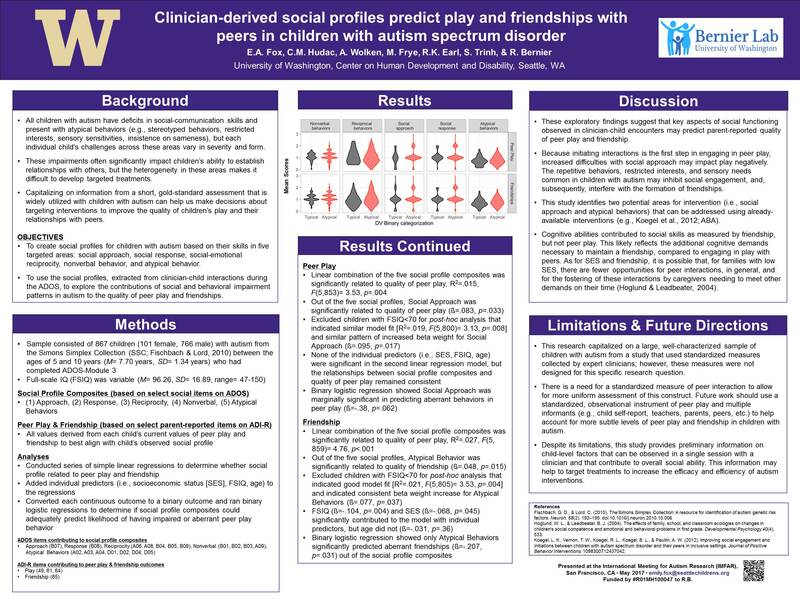 Fox, E.A., Hudac, C.M., Wolken, A., Frye, M., Earl, R.K., Trinh, S., Bernier, R. Clinician-derived social profiles predict play and friendships with peers in children with autism spectrum disorder. Poster presentation at the annual International Meeting for Autism Research (IMFAR) in San Francisco, CA. DesChamps, TD, Cairney, BE, Hudac, CM, Ma, R, Wallace, AS, Troiani, V, Sabatino DiCriscio, A, Taylor, C, Bernier, RA. 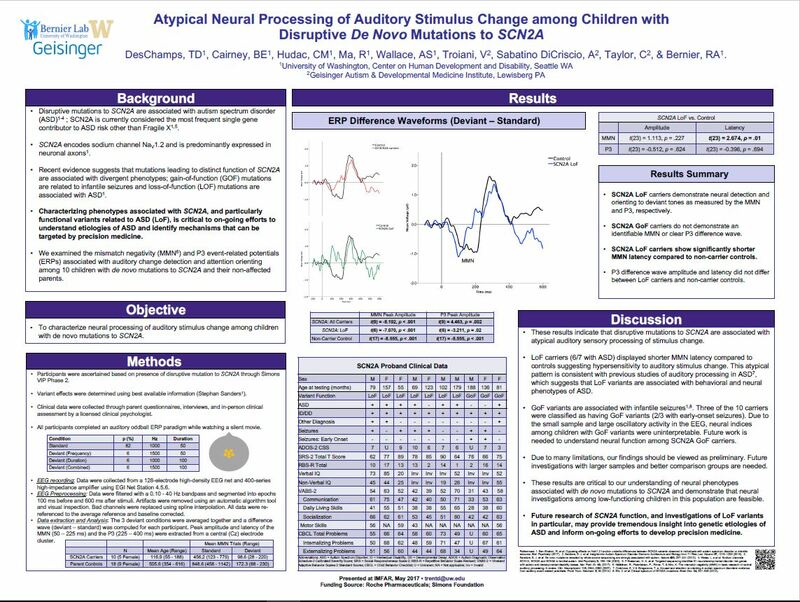 Atypical Neural Processing of Auditory Stimulus Change among Children with Disruptive De Novo Mutations to SCN2A. Poster presentation at the annual International Meeting for Autism Research (IMFAR) in San Francisco, CA. 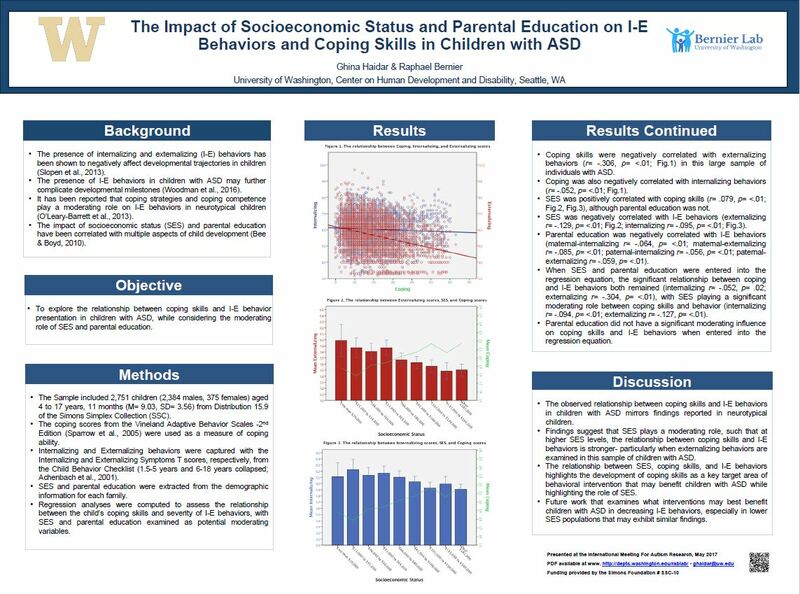 Haidar, G., Bernier, R. The Impact of Socioeconomic Status and Parental Education on I-E Behaviors and Coping Skills in Children with ASD. Poster presentation at the annual International Meeting for Autism Research (IMFAR) in San Francisco, CA. 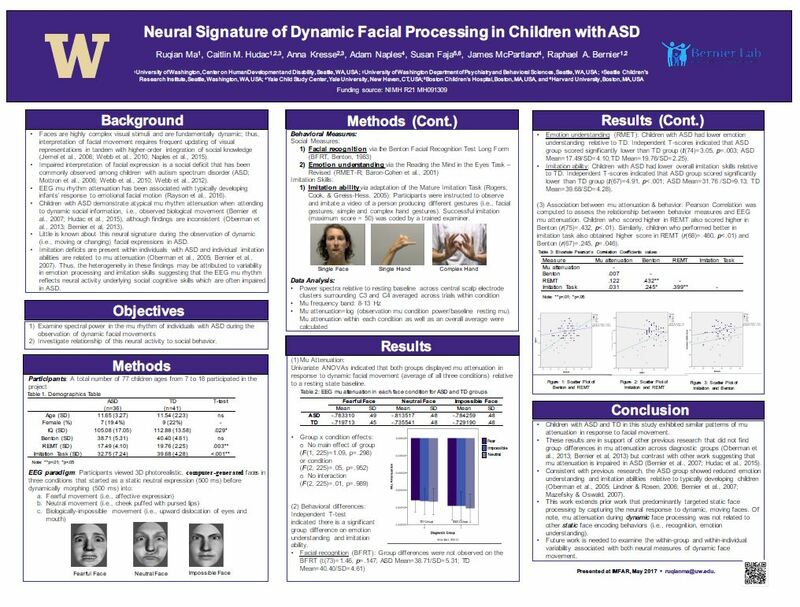 Ma, R., Hudac, C., Kresse, A., Naples, A., Faja, S., McPartland, J., Bernier, R. Neural Signature of Dynamic Facial Processing in Children with ASD. Poster presentation at the annual International Meeting for Autism Research (IMFAR) in San Francisco, CA. 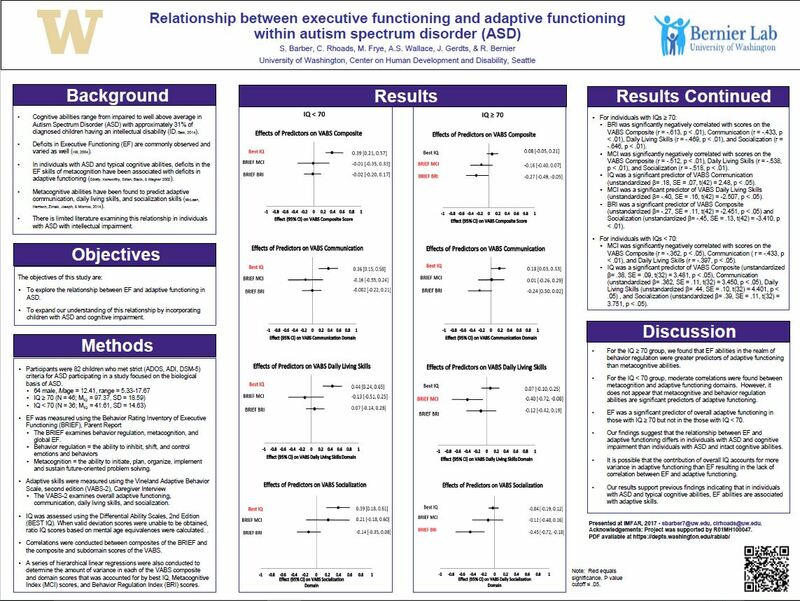 Barber, S., Rhoads, C., Frye, M., Wallace, A.S., Gerdts, J., Bernier, R. Relationship between executive functioning and adaptive functioning within autism spectrum disorder (ASD). 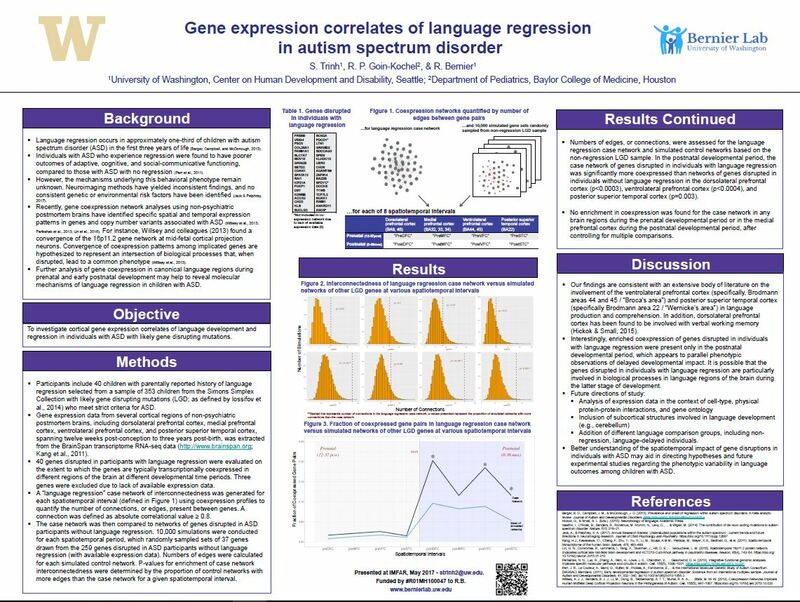 Poster presentation at the annual International Meeting for Autism Research (IMFAR) in San Francisco, CA.